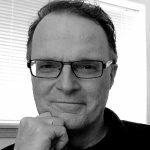 Scott is Chief Optimizer for Webdirexion and includes Marketing, Content Strategy WordPress, CSS, Photoshop, Tai Chi, Pizza and Coffee among his passions. 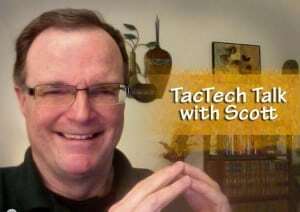 This month, my “TacTech Talk” Column (a new feature bringing a fusion of Tactical and Technical tips for today’s marketers) will cover a recent lead gathering landing page test, some insights on site speed and WordPress themes, and SEO strategy tips. First, I want to say wow — how great our growing team is… and thanks to each of you. All are currently taking online marketing and/or programming courses (including myself… see, you can teach an old dog). I’m lucky to be working with them as Webdirexion celebrates a new site, new logo, and some fun new client campaigns. We recently ran an A/B test for Croc’s Casino Resort, arguably one of our funnest clients — a 17-story Hotel and Casino with three restaurants and a 4-star pool on the pacific ocean in Costa Rica. If you’re scanning the column, the takeaway learned is — always be testing to increase conversions and maximize your ROI. 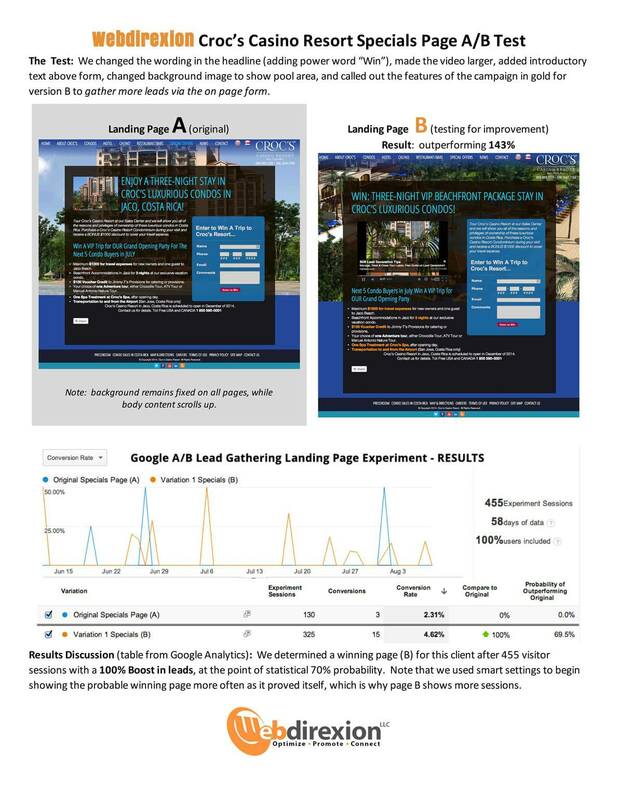 In this A/B lead gathering landing page test for Croc’s we doubled their results. Is Landing Page development an art or a science? Both. And it’s so great that we have easy access to sophisticated testing and tracking programs these days (c’mon marketers… get on with the testing). For the Croc’s test, we watched the numbers (Science) as we adjusted copy, graphics and design (Art) to get results. Click here for a 1-page overview with more details. Again, your takeaway is… always be testing to increase conversions and maximize your ROI. Webdirexion’s new site runs on Divi from Elegant Themes — fast even with a long page full of images (tested at Pingdom). There are thousands of WordPress themes out there and not all are equal. Serious differences emerge when it comes to loading speed. Now speed can be increased via a number of factors including image compression, delivery of images via a CDN (Content Delivery Network), getting a VPS (Virtual Private Server), optimizing your database, cache turbocharging (contact us to help with these things), and reducing the number of plugins you use (thousands of plugins too… and not all coded well — just like some themes). But what about just differences in the themes you use? We develop using child themes for the Genesis framework and for Divi (and other themes available via Elegant Themes). A client contacted us the other day with a slow load problem and after determining it wasn’t due to large images, we took a hard look at his theme, Canvas from Woothemes, and ran some tests. Notes: Seven URLs at top are Webdirexion managed client sites, with the themes we specialize in (except for Thesis). Bottom five are Canvas themes discovered in an article on top sites using Woothemes Canvas theme. All tests were run using Pingdom (try your own sites there). Canvas site #3 in red above has a serious load time issue, but even if you remove it from the group, the other four average a longer load time than the top six in this study. Canvas site #2 is not in the article — it was a site for a client that requested a review of site speed which prompted this analysis. Canvas sites studied average slower load times… Why? Well from experience and from a closer look using the results from the Pingdom tool tests for each site, Woothemes adds more external scripting into their theme builds. We love working with Woocommerce for ecommerce sites, also from Woothemes, and do admire their work, but there appears to be some scripting issues that are causing speed problems with Canvas. I will contact the Woothemes people to get their take on this, and report back in this column. A ton of backlinks are what you need? No. You need high quality “citations” whether they are links or not — Google has evolved to value simple mentions of your site, company, products and services, even with no link. And, it devalues cheap link farms and up values highly ranked sites and bloggers with Klout. Relevance is the name of the game (Google lives or dies on it), and it’s harder and harder to game Google, although blackhat SEO’s still try. Think thin content out, quality content in. Is Social Media Marketing a big part of the new SEO? Yes — Google and other engines now listen quite a bit to “social signals.” And Google also considers site speed (see above), and even has begun rewarding sites that use SSL to combat hacking attacks. And now a question we hear and that still gets asked a lot, “can you guarantee page 1 position for a certain search term?” Short answer — no, no one can. Some will claim they can — usually meaning they will do so for low value terms with little recent search volume. Worthless. But for competitive terms, you a) cannot predict the tactics of your competitors; and b) have no idea of how the Google algorithm changes on a weekly basis. 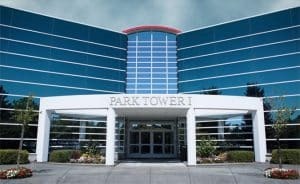 What to do for successful SEO? In a nutshell, continually produce quality content (here’s what Google SEO spokesperson Matt Cutts says about what is not quality content); go after authentic social media connections (don’t rely on robo posting of links); and seek high value klout partners who mention you, swap guest posts, and heed your public relations efforts. Proper SEO work, which places Content Marketing at its core, takes a sustained effort. 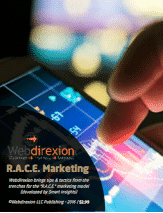 Our Webdirexion SEO formula is: Inbound Marketing + Savvy Media Placement + Social Media + Content Strategy. We will be pleased to quote you on a campaign.